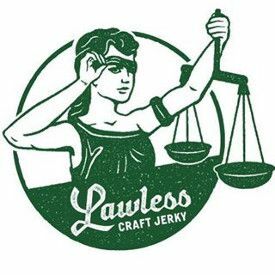 Matt Tolnick, a former attorney, bravely left his law practice, and teamed up with Dan Kaplan to launch the Lawless Jerky brand name in 2013 using 100% grass-fed beef. In Matt’s words “he had the courage to run from the law..to make jerky!”. Lawless Jerky steadily grew over the next five years, reaching millions of dollars in sales. 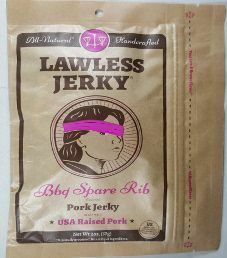 The Lawless Jerky brand name is distributed by Lawless Jerky LLC, and they used to be located in Santa Monica, California. The next review on Lawless Jerky will focus on a 2 ounce/57 gram bag of their Bbq Spare Rib flavored pork jerky. At the moment, this flavor is not currently for sale. Lawless Jerky not so long ago moved to a new co-packer, where they could only start with three flavors. We here at Jerky Ingredients certainly hope that this Bbq Spare Rib returns soon. The bag was kindly submitted by the Lawless Jerky Team. Ingredients: Pork, Salt, Tamari (Water, Soybeans, Salt),Brown Sugar, Ketchup (Tomato Concentrate from Red Ripe Tomatoes, Distilled Vinegar, Sugar, Salt, Onion Powder, Spice, Natural Flavoring), Apple Cider Vinegar, Honey, Garlic, Ginger, Sun Dried Tomato, Cinnamon, Onion, Chili Pepper, Cloves, Black Pepper, Star Anise. Allergen Warnings: Soy. The pork used is guaranteed to be raised with no antibiotics and no added hormones. This pork is not guaranteed to have at least partial free range access to roam about outside. As a result, the highest ingredient rating that can be awarded is a Very Good (9/10) rating. This interesting liquid marinade is comprised of a good brand of gluten-free tamari soy sauce, a very good brand of ketchup, super healthy apple cider vinegar, and healthy honey. 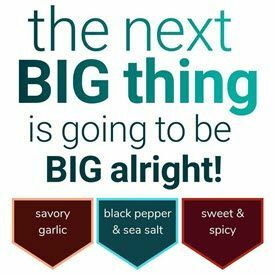 There are many healthy ingredients added such as the healthy trifecta of garlic/ginger/onion, sun dried tomato, cinnamon, chili pepper, cloves, black pepper, and star anise. The sugar level is decent at 3 grams of sugar per 28 grams of jerky. The salt level is acceptable at 320mg of salt per 28 grams of jerky. This jerky does qualify to have no sodium nitrite used, or any other similar unhealthy preservatives. Instead, salt is the main preservative used. Admirably, this jerky qualifies to have no MSG added. OMG, this should be Outlawed! I must have died and went straight to Jerky Heaven. This Lawless Jerky BBQ Spare Rib Pork Jerky is out of this world. This jerky aroma, texture and taste are nothing short of spectacular and delicious. The folks at Lawless Jerky know their jerky and they take it very seriously. They have high standards and it all translates very clearly from the very first bite. The texture is not too dry or too soft, it’s the perfect chew. The taste is absolute Dynamite, as I chew a piece; all these beautiful flavors come to life in harmony. As I said earlier, all seasonings work really well together without interfering or overwhelming one or another. The barbecue flavor is unmistakable, the ketchup and sun dried tomatoes with the tamari and garlic creates a rich and decadent flavor. 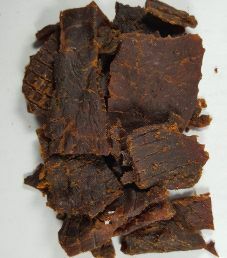 There is so much going on with this jerky, it is a complex flavor profile with exotic nuances and captivating spices. These jerky pieces are a mixture of very small to small and medium in size. The thickness varies from thin to medium and it is fairly dry and still easy to chew. Mark stated: “In 2015, Paul and I had the privilege to try a prototype of this BBQ Spare Rib flavor for just our personal opinion, and not for official review. We loved this flavor back then, and certainly love this flavor just as much today. This is most likely my favorite Lawless Jerky tried to date and this coming from a person who would normally choose beef jerky over pork jerky. This BBQ Spare Rib pork flavor should be against the law on how good it tastes, where I could empty my wallet and bank account on this flavor”. Mark also looked up a few things and as suspected, he did a quick check of all our 17 pork jerky flavors reviewed to date. This BBQ spare rib pork jerky is bar none the best pork jerky that we have reviewed to date. We all agreed, it’s nearly impossible to put down the bag. We’ve all devoured our jerky in record time. This jerky is recommended to everyone, pork or barbecue fans or not. In fact, if you are a fan of life or food at all, you owe it to yourself to try this jerky. This jerky is so tasty you will fall head over heels in love with this Lawless Jerky BBQ Spare Rib Pork Jerky and you will be happy you did give it a whirl. This is exactly the way great BBQ Spare Ribs should taste like and we’ve passionately awarded this flavor a very well-deserved Excellent (10/10) taste rating. Two thumb way up, all the way to the moon, the stars and the next galaxy. PS. We did not need to take out the ol’ boxing gloves this time around, we were all unanimous on these simple facts of life, Baby! A 2 ounce/57 gram bag sells online for $5.99. That works out to $3.00 an ounce, which rates as an upper limit average price. Free shipping is offered on orders over $50. While the trademark for Lawless Jerky is “A Braver Flavor!”, it could also be “A Braver Bag”. Unusually, this bag opens vertically, as opposed to horizontally. Everything is imprinted directly on the bag, both the front and back. There are no labels affixed to this bag. 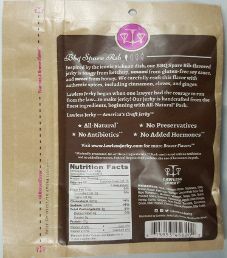 There are some facts displayed on this bag such as “All-Natural”, “Handcrafted”, “USA Raised Pork”, “Authentic Flavors”, “No Preservatives”, “No Antibiotics”, and “No Added Hormones”. All bag categories are covered with this bag except for one. There is no transparent window to view the actual jerky strips. On the back, there is a great blurb written about the Bbq Spare rib flavor itself, and about Lawless Jerky.